Chocolate tourism is one of the interesting activities during a child's vacation. It because chocolate is one of children's favorite food. Inviting them on vacation while seeing the process of making chocolate will be a fun activity. Here are six things about Tugu Chocolate that provide chocolate tours and facilities to learn to make chocolate. Chocolate Tugu is one of the famous chocolate brands in Yogyakarta. The factory location is on Jl. Tegal Gendu No.31, Prenggan, Kotagede. To get to the location, visitors can use public vehicles in the form of Trans Jogja or online transportation. Accessing transportation is very easy for visitors. It because the chocolate Tugu is still inside the city and in the tourist area. Visitors can come to Tugu chocolate shop from 9:00 a.m. to 3:30 p.m.
Tugu chocolate's material mostly comes from domestic chocolate gardens. And it proves that Indonesian chocolate has very good quality. One of the places that are the source of raw material in Tugu chocolate is chocolate garden in Wonosari, Yogyakarta. There is a large garden filled with chocolate plants. This garden is deliberately cultivated to supply the domestic chocolate factory market. This chocolate brand has high quality and a very delicious taste. But people can get this chocolate at a cheap price. Its price is around 20,000 to 80,000 rupiah, depending on the size of chocolate. The taste offered by the chocolate Tugu is unique. Usually, chocolate is only combining various types of nuts and dry fruits such as raisins or dates. 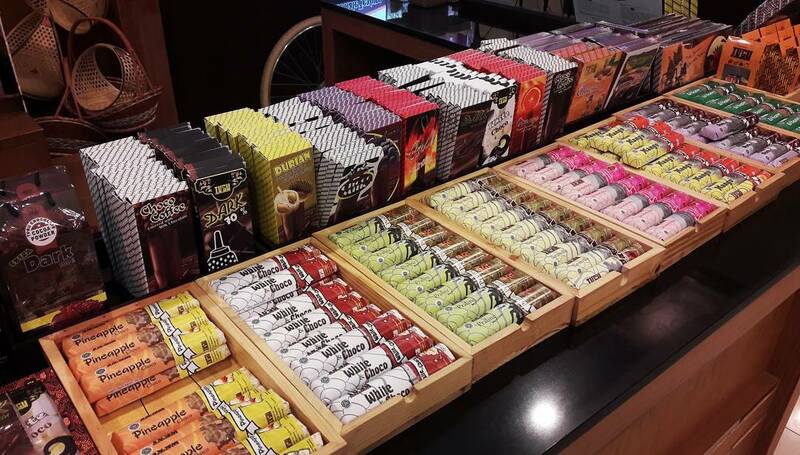 However, in the chocolate Tugu tourists can find chocolate with the chili powder, coffee, and mocha fillings. Tugu Chocolate choose to use unusual fillings, so buyers feel the sensation of eating chocolate with a distinctive taste of Yogya. This uniqueness makes Tugu chocolate is suitable to be souvenirs for family or friends at home. Being in the center of silver crafts makes this chocolate factory crowded with visitors. In the shop, visitors can see the process of making chocolate and enjoy the atmosphere of a typical Yogya house. A large transparent glass is separating factories and shops. It can give visitors the opportunity to see how they make chocolate. To see this process, visitors are not charged additional fees. Anyone who comes to chocolate Tugu will get to know knowledge on how to make chocolate. Furthermore, visitors can also learn to make chocolate. They learn to make it in an attractive form like a pink heart shape. So children and adult really enjoy the chocolate making process. If visitors want to take part in cooking classes for learn to make chocolate, they must make a reservation first. Especially if you want to join a large number of cooking classes. Chocolate Tugu inspired by an icon of the city of Yogyakarta, namely Tugu Jogja. Chocolate Tugu wants to become one of the icons of the city of Jogja in the culinary field.